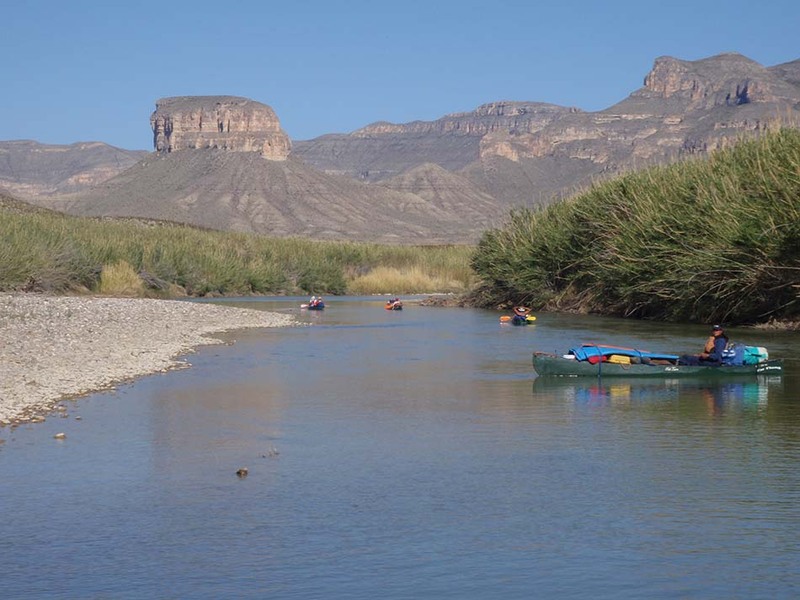 The legendary Rio Grande flows through some of the most beautiful and desolate desert canyons on the continent and is truly one of America’s premier wilderness canoe tripping rivers. 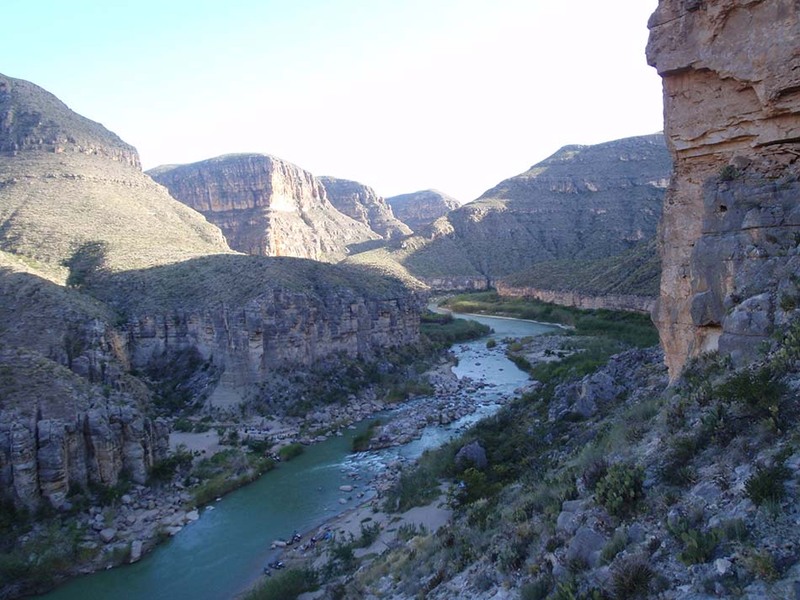 A true classic of the American Southwest, the Rio Grande forms the long, wild Texas/Mexico border and cuts through the heart of the intensely rugged Chihuahuan Desert. 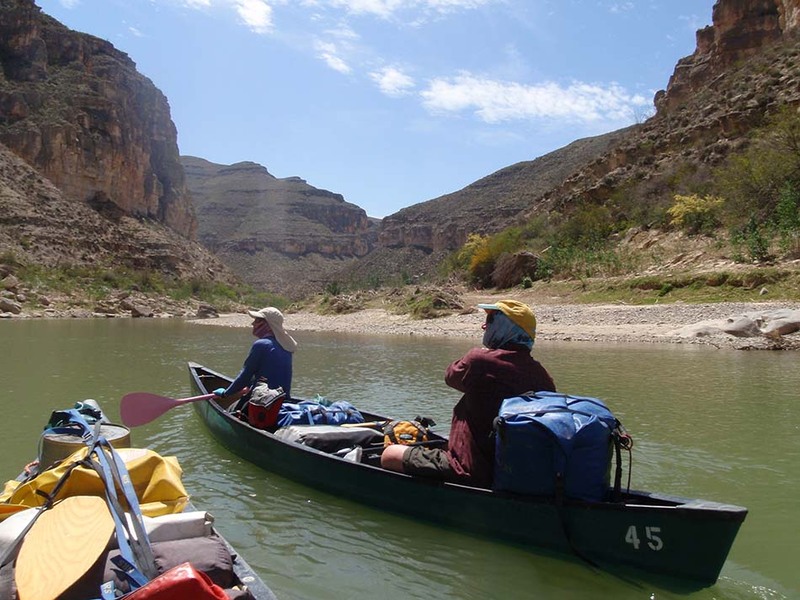 A canoe trip on the Lower Canyons of the Rio Grande is essentially a mellow trip, with placid water and easy current alternating with short, slightly technical rapids (mostly Class II). 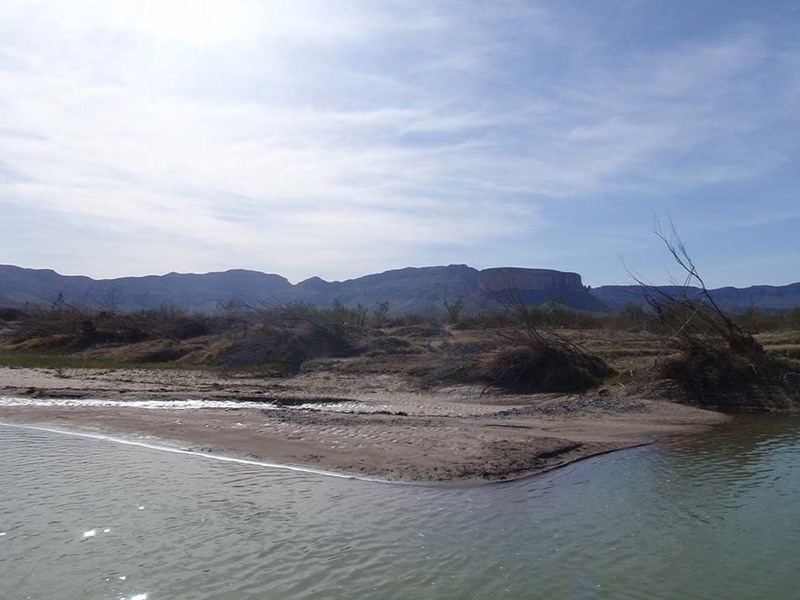 One of the most commercially important rivers in the entire United States, many people envision the Rio Grande by what they have seen on the news; a river that is narrow and shallow enough to walk across in most places. 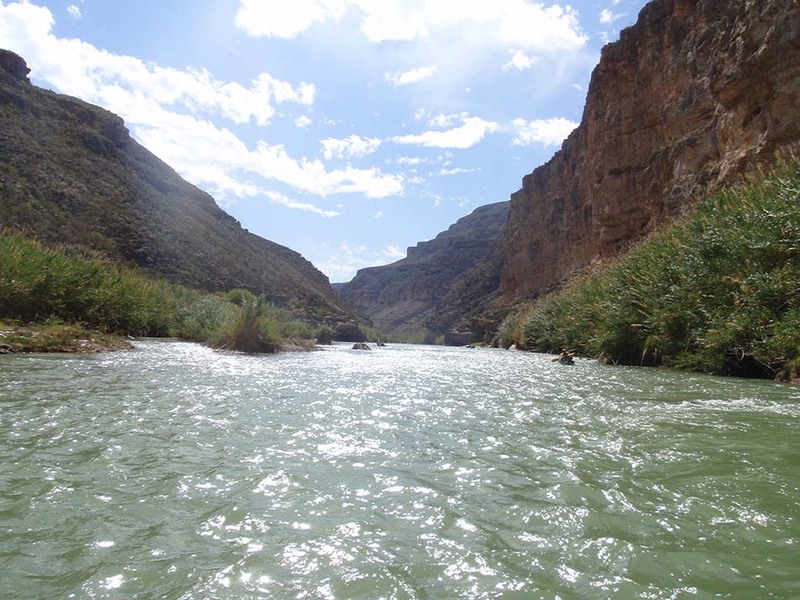 While true in many locations, particularly downstream of Big Bend National Park, the Lower Canyons is easily the most rugged, remote and spectacular section of the nearly 1,900-mile long waterway that flows through the heart of the American Southwest from central Colorado to its terminus at the Gulf of Mexico. 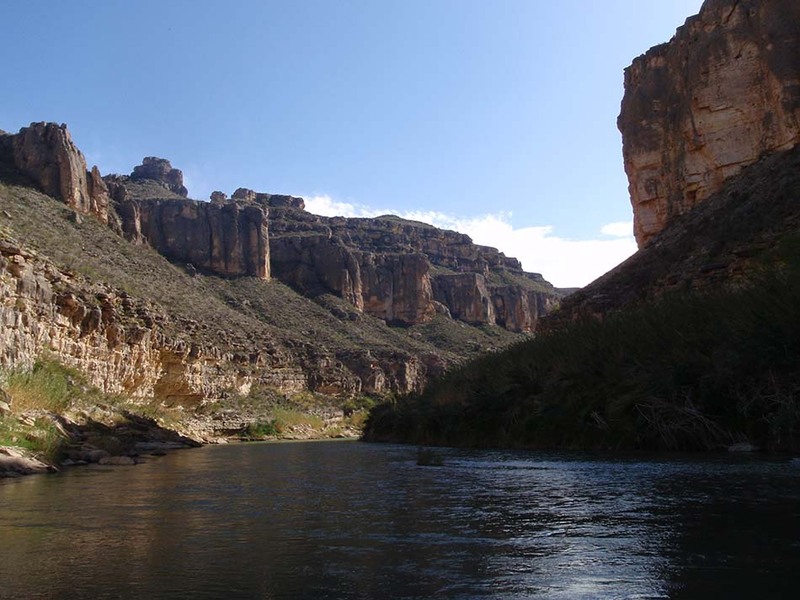 The remote nature of the Lower Canyons of the Rio Grande cannot be understated. For the duration of our 92-mile canoe trip, no bridges span the river and only a handful of rugged dirt tracks lead from the river corridor back to civilization. Travel in this area is only for the hearty and adventurous souls wishing to view a part of the country that is some of the most unique and breathtaking on the continent. 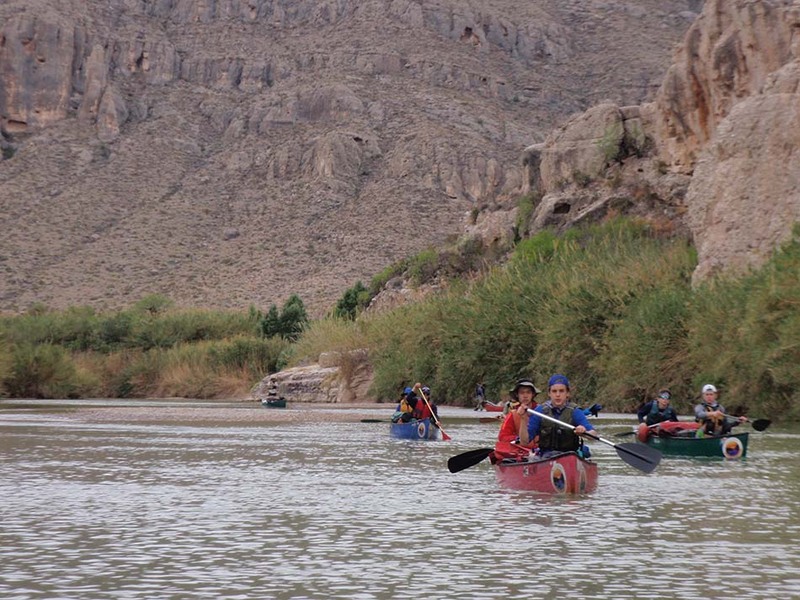 While officially outside of the boundaries of Big Bend National Park, the Lower Canyons of the Rio Grande have earned designation as a Wild & Scenic River by the United States government and traditionally sees less than 300 paddlers traverse its entire length in any given calendar year. 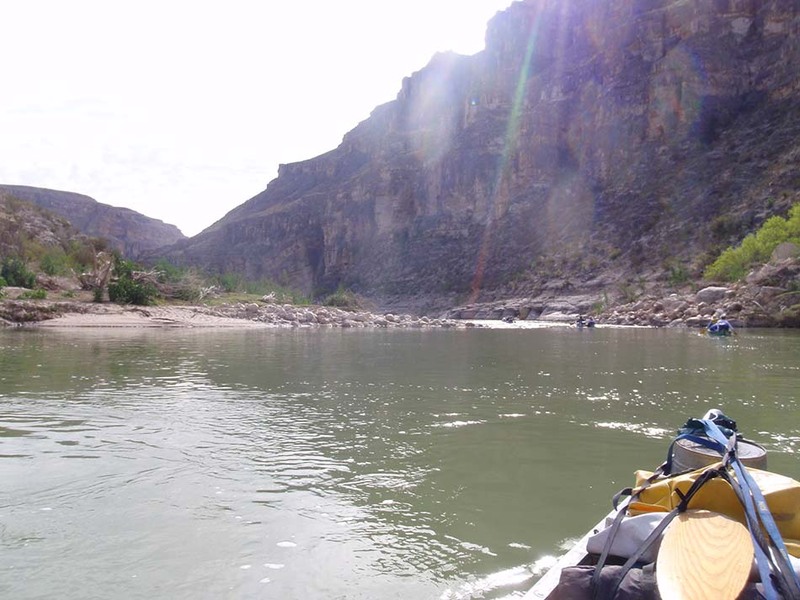 For those looking for easily the most remote canoe trip in the lower 48 states of the United States, the Lower Canyons of the Rio Grande is certainly the best option. 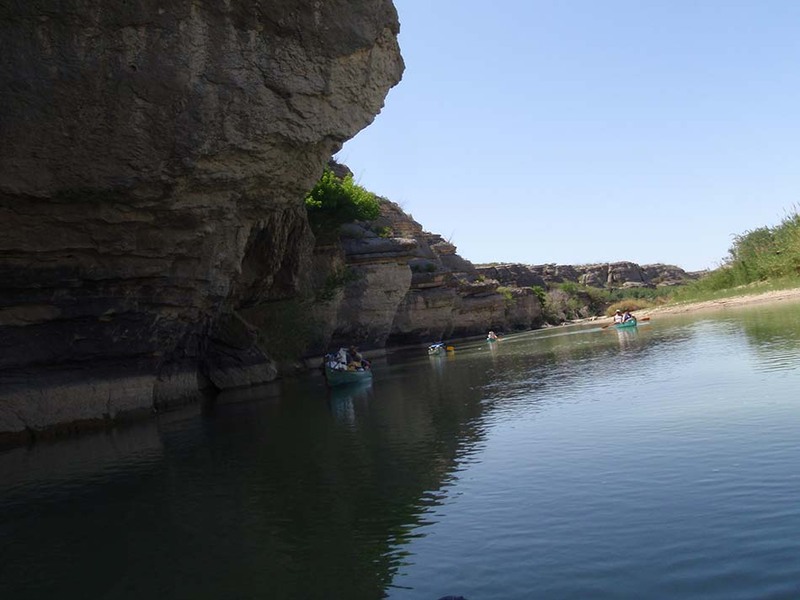 Guided canoe trips of the Lower Canyons of the Rio Grande with Smoking Rivers begins at a small ghost town called La Linda, Texas, once home to a feldspar mine on the Mexican side of the river that has been clossed for nearly two decades. 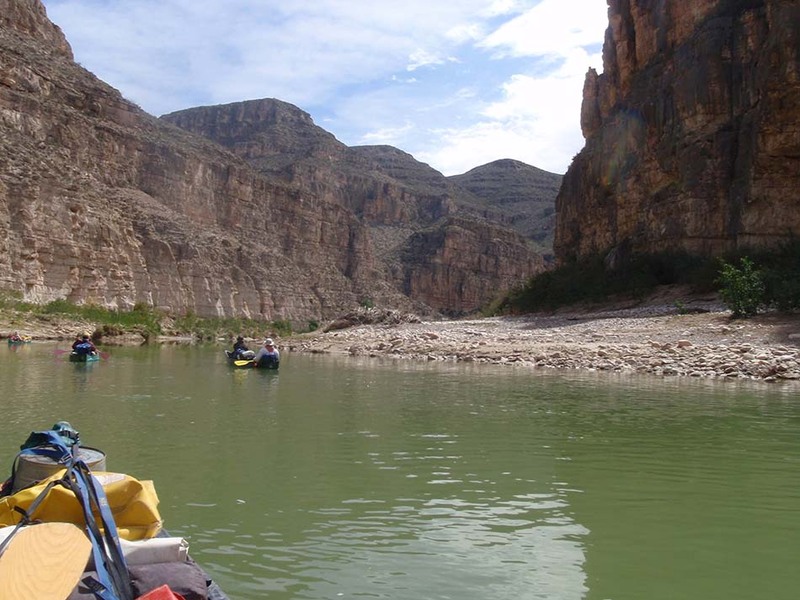 Once departing in canoes from La Linda, canoe trips on the Rio Grande pass into the first small, yet inspiring canyon before the terrain flattens as paddlers traverse through an area of lowlands called ‘Las Vegas de Los Ladrones’ or ‘Outlaw Flats’. 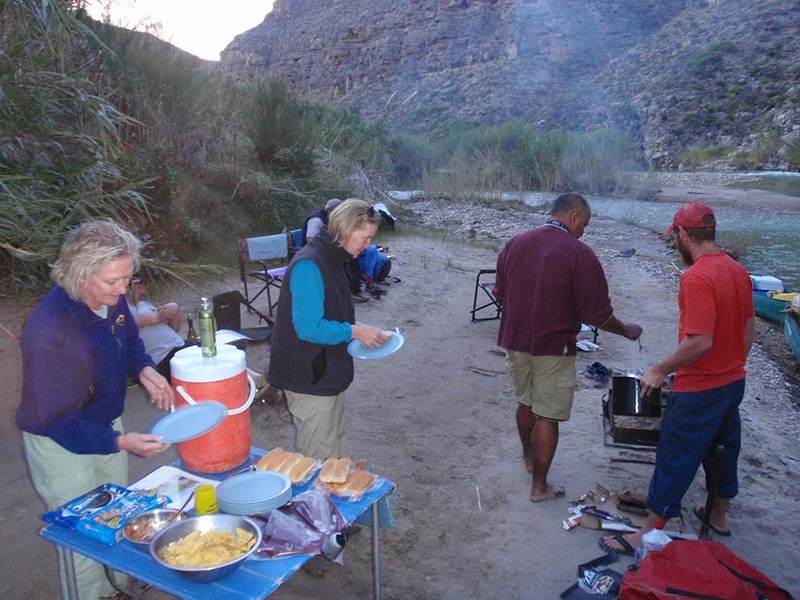 We camp each night at primitive campsites on the river’s edge, watching the sun slowly set over the expansive canyon walls is spectacular in the desert spring and is something to be savored before entering the depths of the canyon. 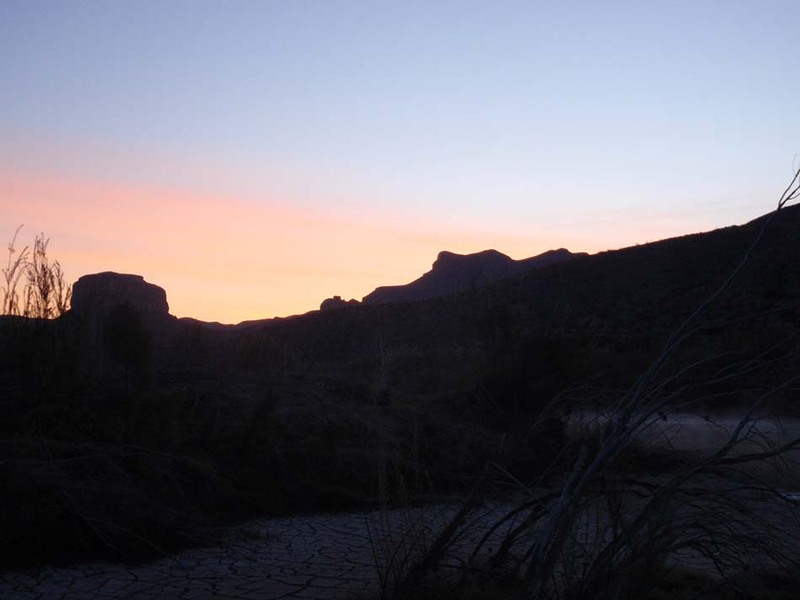 Star gazing, particularly throughout the Outlaw Flats is usually quite excellent; as the Chihuahuan Desert is considered a ‘high desert’ and far from any type of light pollution. 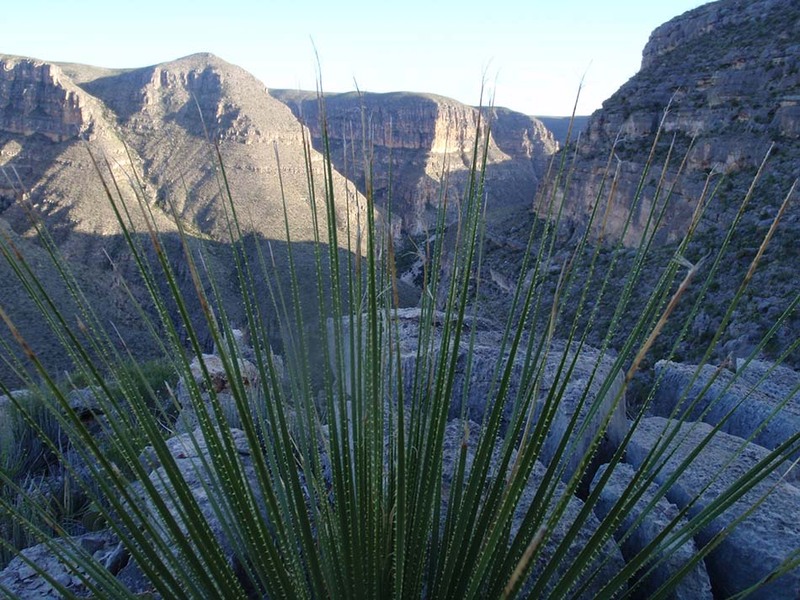 In fact, Big Bend National Park and the Lower Canyons of the Rio Grande claim the clearest skies of any National Park in the lower 48. The Outlaw Flats and its gentle succession of desert flats and beautiful, sweeping vistas, at times marked by notable and stunning landmarks such as Castle Butte, slowly ends as guests will notice the canyon walls increasing in size and getting closer with every passing mile. 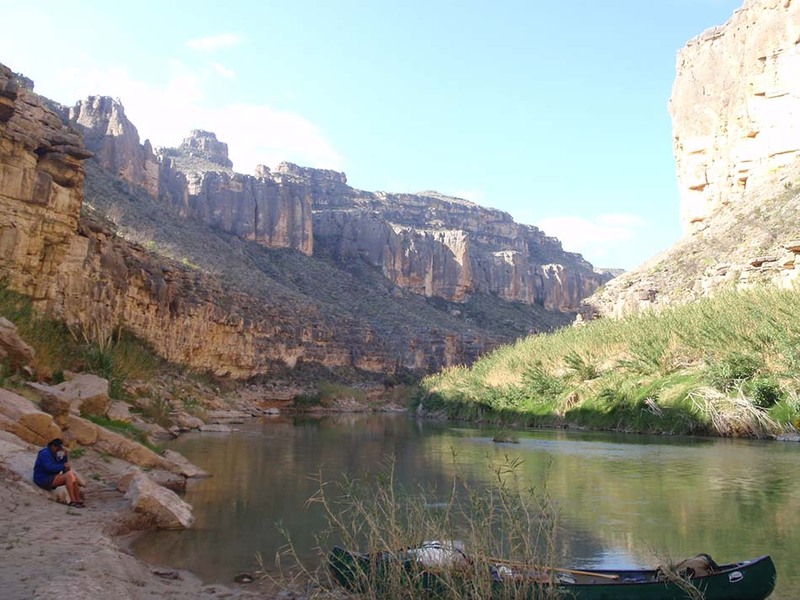 Soon, you will feel as if the river is starting to narrow and the canyon walls begin to close in. This, for many paddlers, is an exciting feeling that is very unique on a canoe trip and heralds the entrance into the deepest and most remote part of our trip. 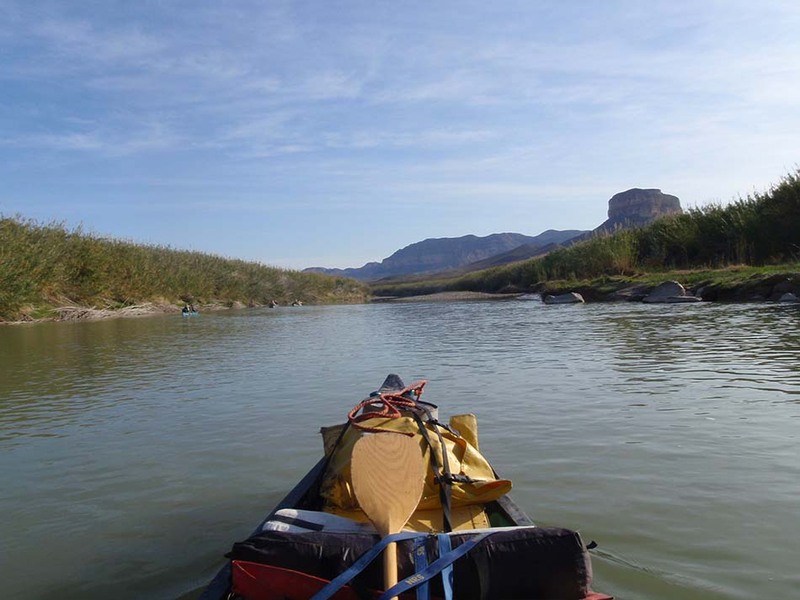 Fed by a series of side-canyons, many of which we have the option to explore throughout the canoe trip, the canyons are nearly 50-full miles in length without a break, featuring one of the best opportunities for an extended length, canyon canoe trip in the United States. Deposit: 50% Deposit required at time of reservation. 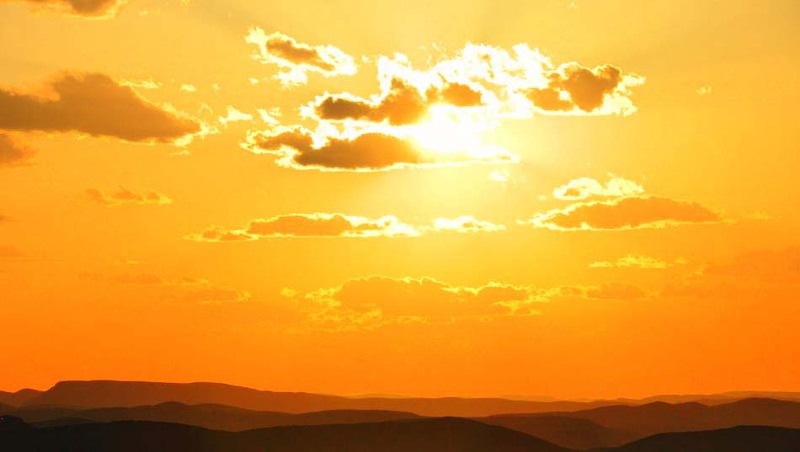 Remainder due no later than (21) days prior to trip departure (non-refundable). Group and Youth rates available. Rates are based off a 4 person trip subject to change depending on group size and duration. Trips fill up quickly and your desired dates may not be available. Contact us today to make sure you can get your dream trip on our schedule. 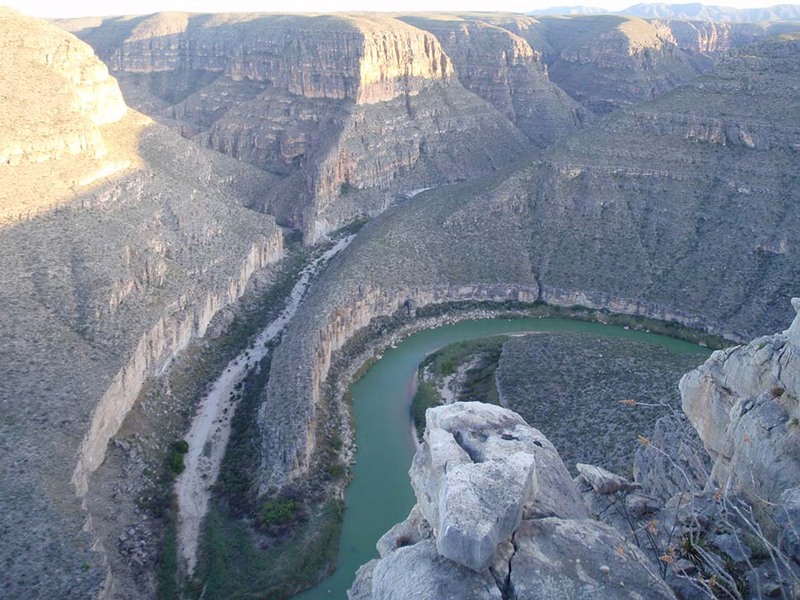 Not fully explored in its entirety until very late in the 19th-century, the Rio Grande is still regarded today as one of the nation’s last real frontiers and forms the border of Big Bend National Park. 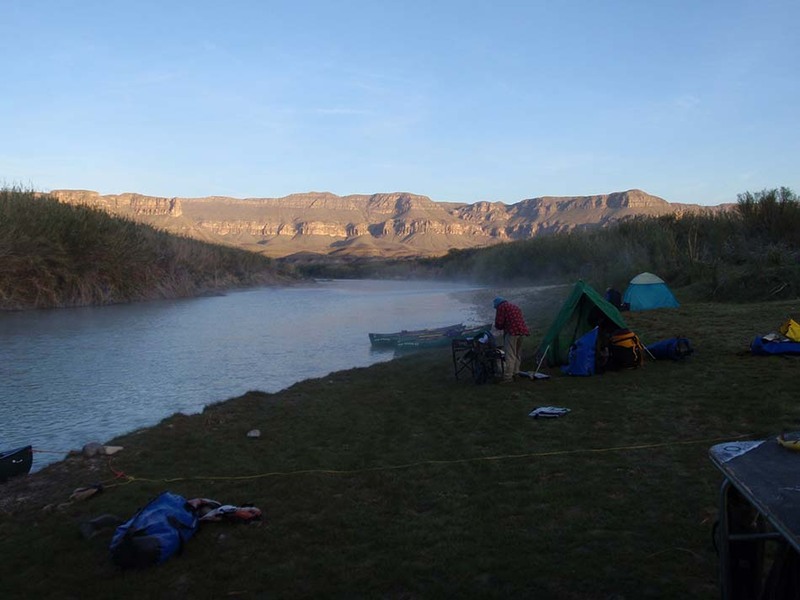 Smoking Rivers preferred trip is the most isolated and spectacular section of the Rio Grande, the “Lower Canyons”, featuring massive buttes and peaks rising off of the desert flats, then a succession of canyons, with miles of subtly hued walls, at times thousands of feet high. 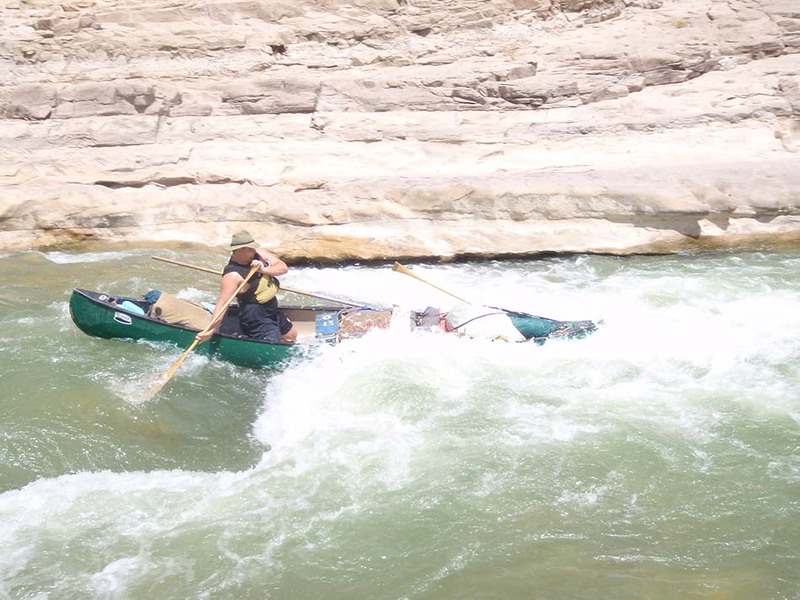 The whitewater throughout this American Southwest canoe trip is generally quite easy, with Class I-II sections making up the vast majority of the sets. These sections tend to be very exciting rapids, as the water is shallow yet fast moving and paddlers need to be keenly observant for hazards such as rocks and cane laying into the river on corners. Great photo opportunities abound for those with a camera at rapids that we will scout, such as Rodeo, Sanderson, and Upper Madison. Paddling experience is not required, however canoeist of all skill level will enjoy the education as our guides will attentively negotiate and teach the party through the white water sections, occasionally utilizing a technique of lining the canoes around rapids that are too difficult to maneuver through by paddling. 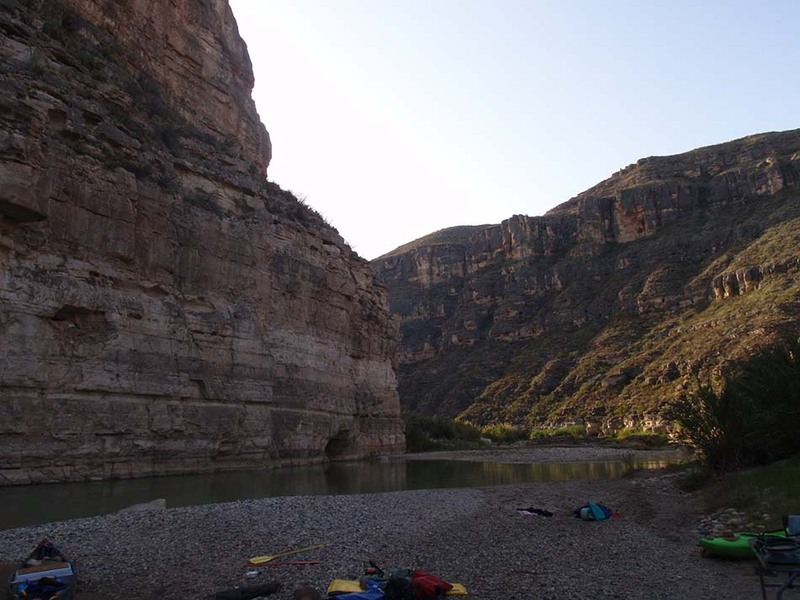 Upon reaching the deepest part of the canyon at Upper Madison, our canoe trips on the Lower Canyons of the Rio Grande builds time into our schedule for a half-layover day at this beautiful campsite shadowed by shear vertical canyon walls. 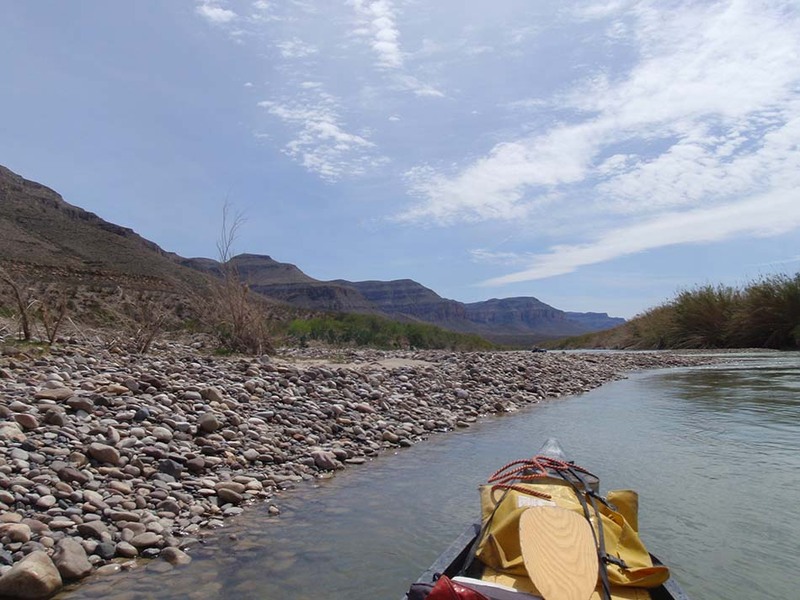 One of our favored sites on the entire river, nestled beneath an ever impressing canyon wall in a grove of mesquite trees overlooking the largest rapid in the lower canyons, Madison. It is from this location that we have the option to take a wonderful side-hike to the top of the adjoining peak, Burro Bluff. 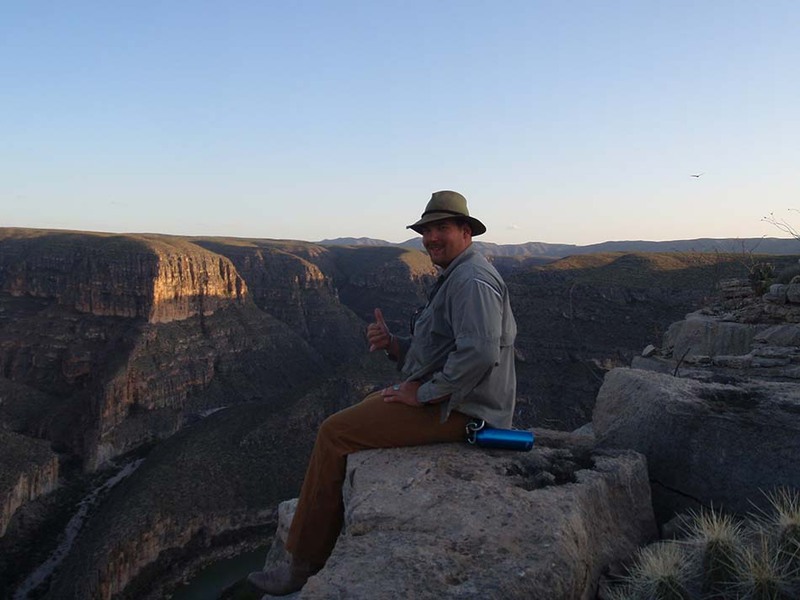 A moderately challenging hike, the effort is rewarded with outstanding views of the Lower Canyons, and you can see miles upon miles in every direction, with the stunning side canyons that feed the river to the expansive flat lands that stretch for miles from the apex of the canyon walls. Words cannot do the view justice and will make you feel as if you are truly paddling a river that is located in the depths of the earth. 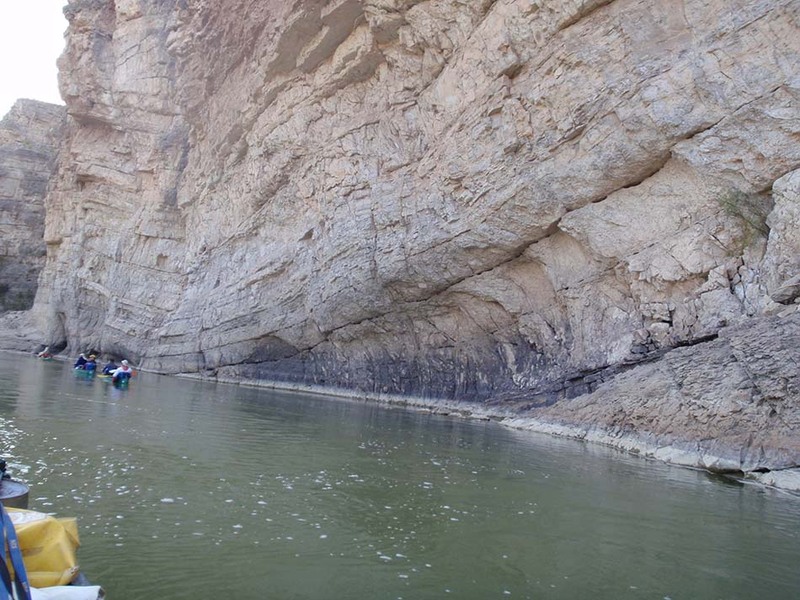 From its deepest point, the canyon walls slowly begin to recede and paddlers will notice this occurring, particularly over the last two days of the expedition. However the beauty of the scenery does not lose its allure and there are ample opportunities to view wildlife. 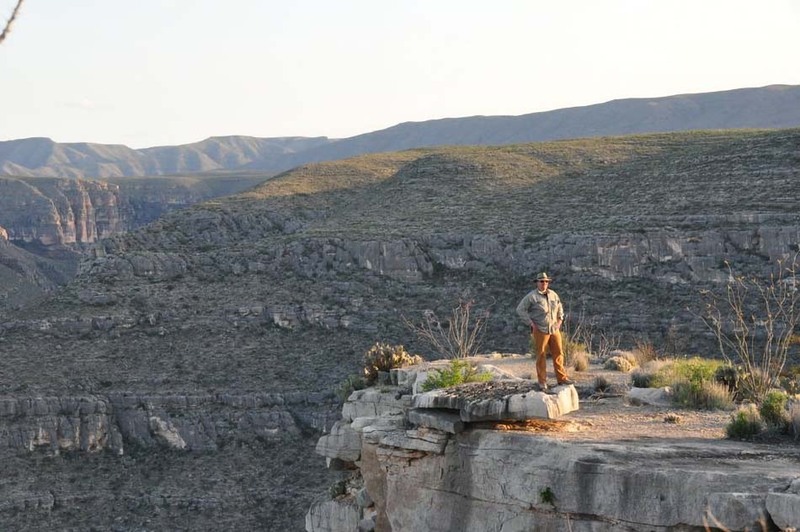 While the Lower Canyons of the Rio Grande is home to black bear, mountain lion, and ring-tailed cat, the most common sightings are of feral cattle, sheep, as well as turtles. 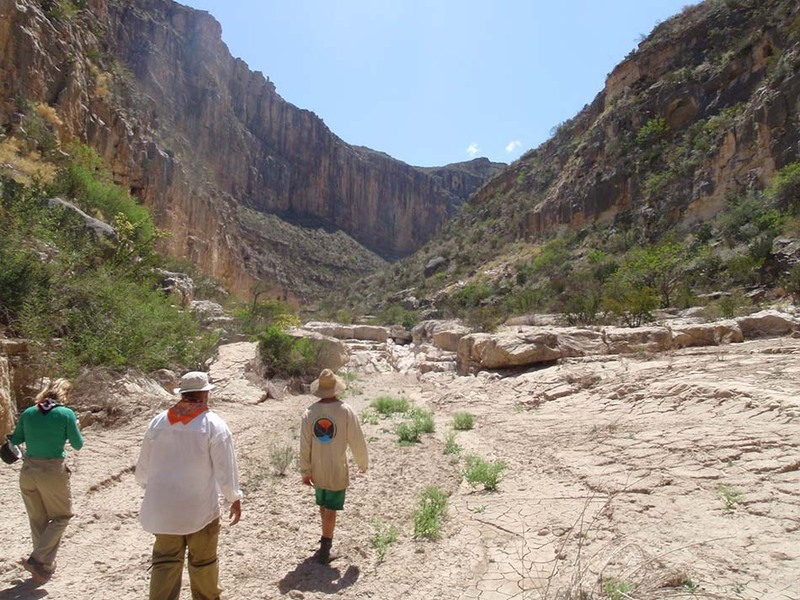 For avid birders, the Lower Canyons of the Rio Grande is in one of the most popular migration routes for birds of all species returning to the United States from South America in the spring and opportunities for spotting rare species abound. 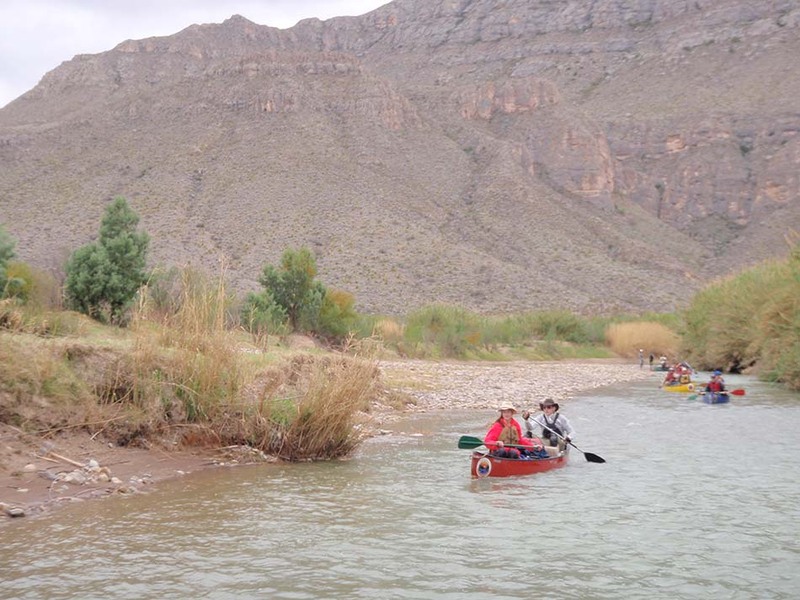 Fishing, while generally not a popular option on the Lower Canyons of the Rio Grande is for catfish and paddlers are welcome to try their hand at angling for this fish. 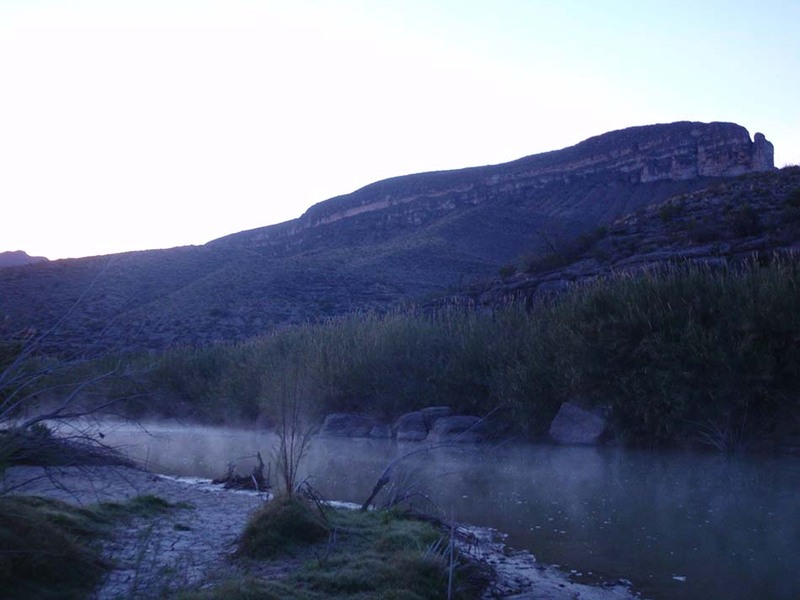 Smoking Rivers runs the Lower Canyons of the Rio Grande at optimum season. March through mid-April is springtime in the southwestern desert. Cacti and multitudes of wildflowers are flowering and the climate is perfect, fairly hot and dry with an abundance of sunshine, no flies, and perfect swimming. 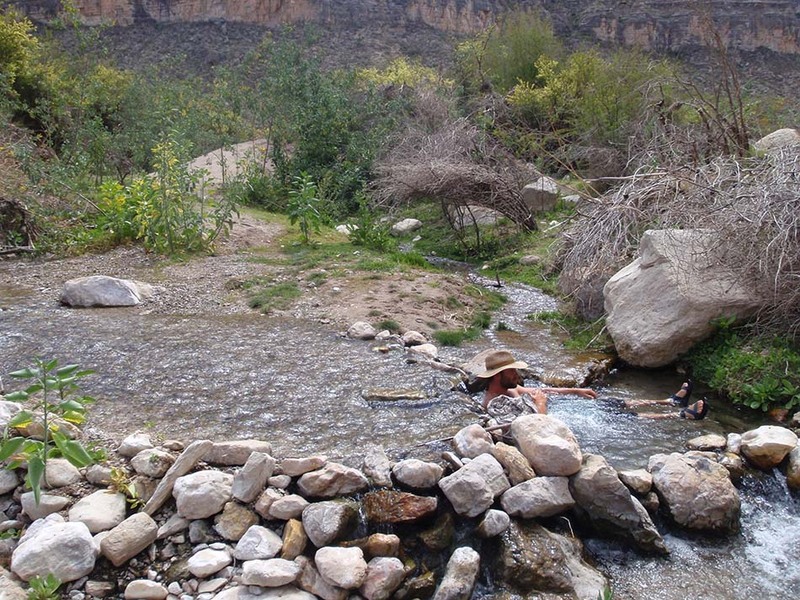 Including opportunities to refresh in numerous hot springs that enter the river, makes for a perfect evening treat to wash up in before a relaxing fire side dinner. 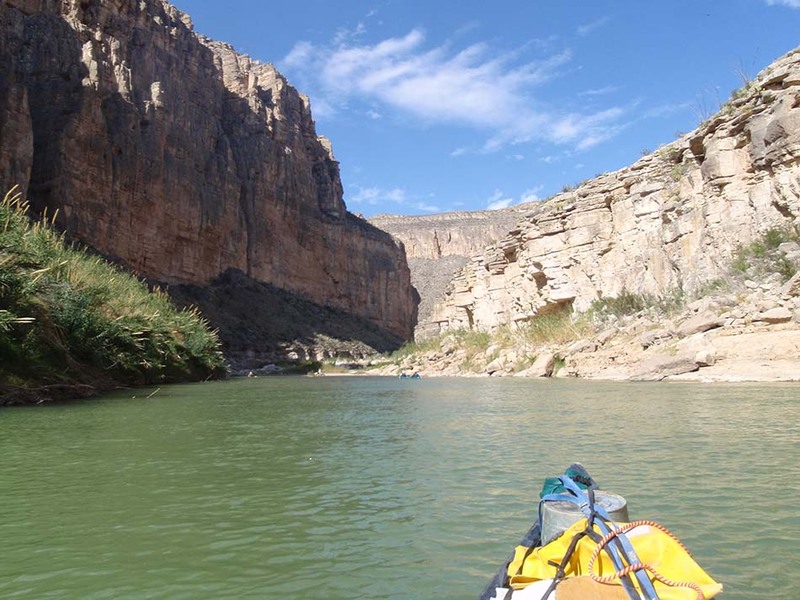 The Lower Canyons of the Rio Grande is a must-do for any adventurous spirit and those who are looking relax away from society on one of the most remote canoe trips available anywhere. 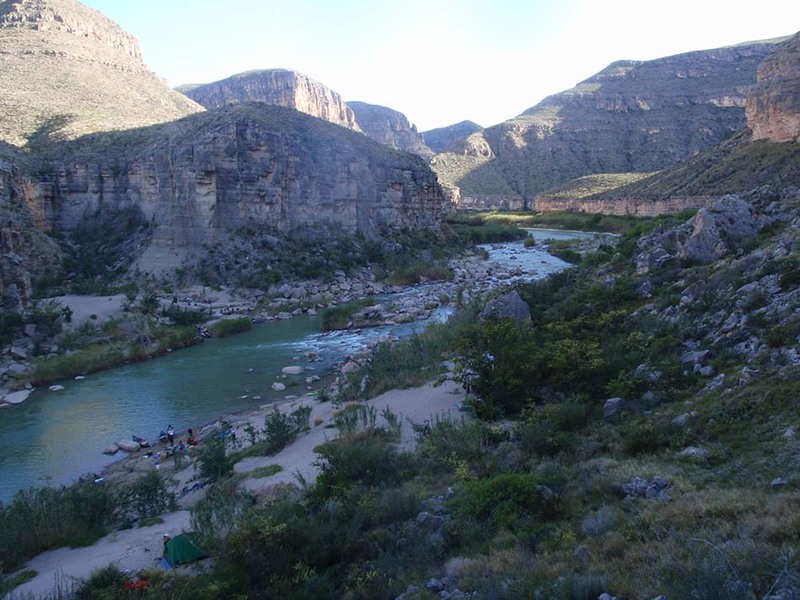 Typically, Smoking Rivers offers the trip every March, a perfect time to escape the cold and snow of a long winter to play in the sun and warmth of southwest Texas. 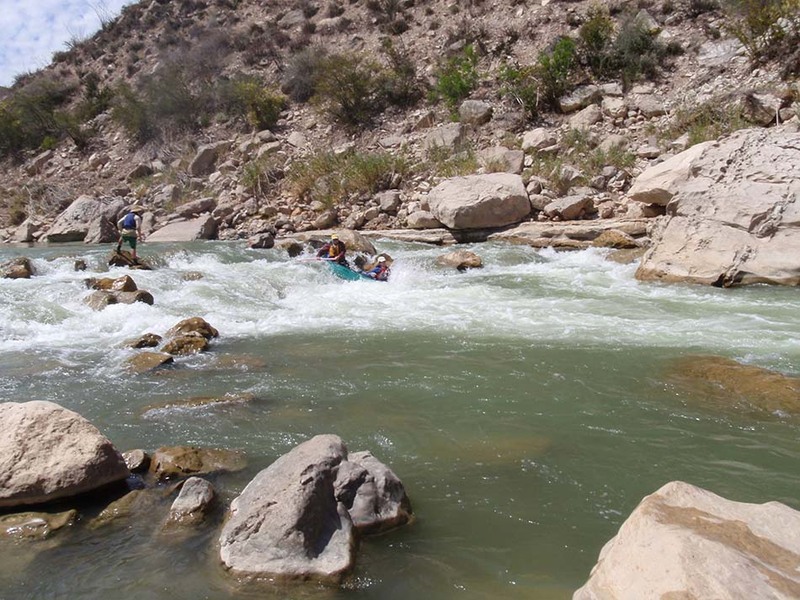 The trip, suitable for those over the age of 12, is not physically arduous and does not include large whitewater, making it an excellent option for most paddlers. 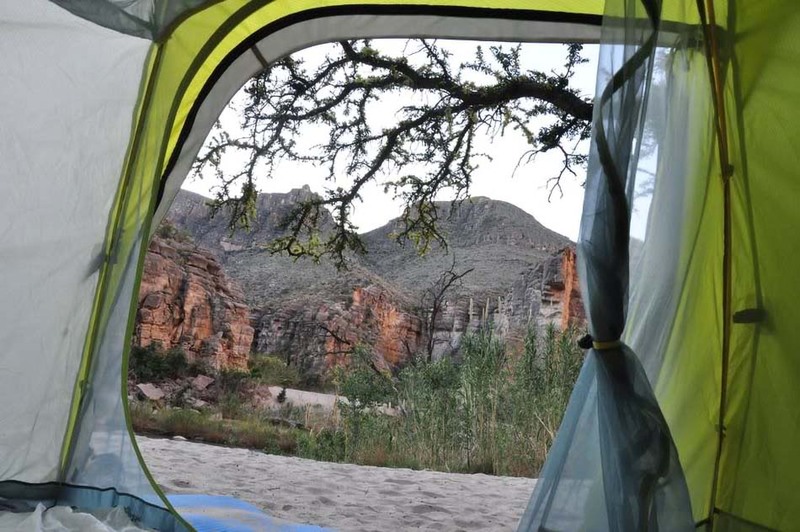 However, some camping experience is recommended due to the remote nature of the trip and extended length. 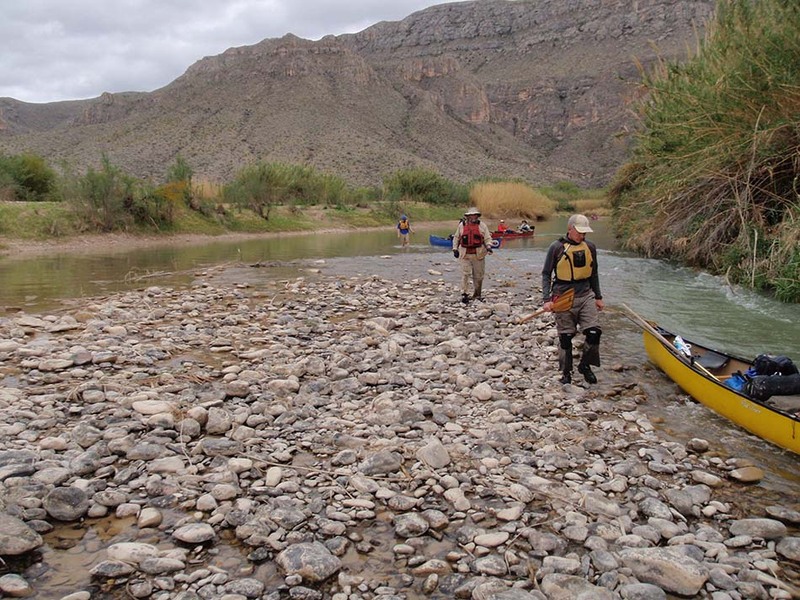 Smoking Rivers organizes our Lower Canyons of the Rio Grande canoe trip as a 9-day river expedition; for those seeking a shorter option, a trip on the Boquillas Canyon of the Rio Grande is another great option. 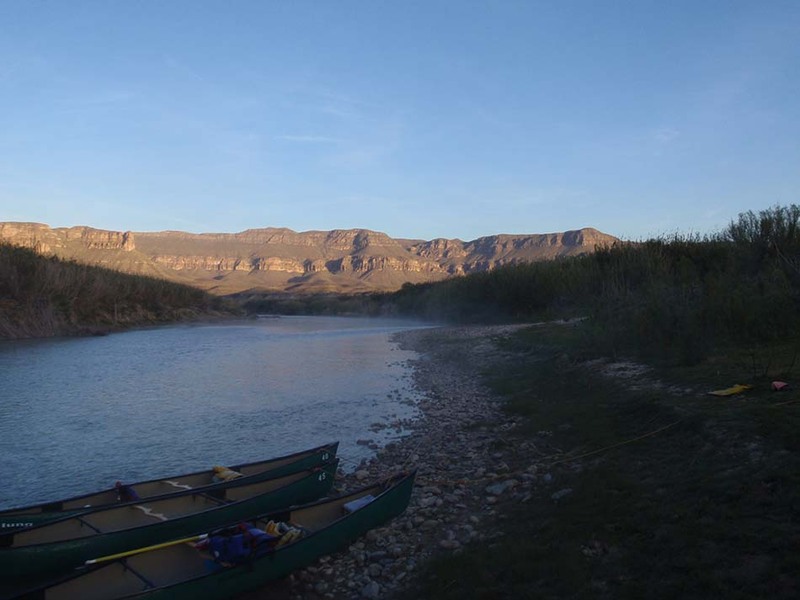 Smoking Rivers, in accordance with all policies of Big Bend National Park, holds a Commercial River Use Authorization from the Department of the Interior and is currently one of the only outfitters offering fully-guided, fully-outfitted canoe trips through the Lower Canyons of the Rio Grande.